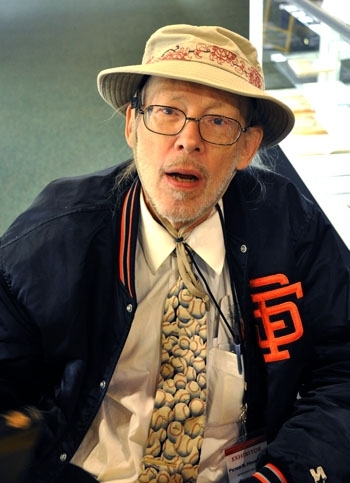 Both a huge Giants fan and a giant in his own field, Serendipity Books founder and owner Peter Howard died of pancreatic cancer in his home on March 31. He was 72. The fate of Howard's lifework - the labyrinth-like store teeming with all kinds of books - is still unclear as his family looks to sell the location and inventory. Some potential buyers have expressed interest but nothing has been finalized, one of his daughters said. Howard died among friends and family with the television tuned to the Giants-Dodger opening game after battling cancer for a little over a year. Known as one of the most prominent antiquarian book dealers in the world, Howard originally intended to be an English teacher. As a UC Berkeley graduate student, he worked for his Ph.D. in English for nine years but never finished his dissertation. For the first two years as a graduate student, he taught entry-level English while adding to the campus's graduate student library, and he quickly realized the latter was his calling. "I think he realized that he had a great talent in that world (of antiquarianism) and maybe not such great talent in academia," his daughter Esme Howard said. "He loved it." Peter Howard then started selling books from his house on Colusa Avenue in 1963. In 1967, he opened his first store on Shattuck Avenue, which later expanded to five storefronts on the same street. He purchased the current location on University Avenue in 1986. Peter Howard's style for buying rare books was to purchase collections in huge quantities - in this manner, he started to accumulate an enormous inventory, according to his niece Sasha Crehan. The bookstore holds at least one million books with many more stored at a warehouse, longtime friend and colleague Marc Selvaggio said. According to friends and family, Peter Howard was known for his generosity, often selling books on credit for his customers as he saw fit. Some of his colleagues, including Dan Adams and John Crichton - who both own bookstores in California - cited Peter Howard as being influential in starting them onto the antiquarian vocation. "He was very helpful to a good many beginning booksellers, whom he would take under his wing and help out," Edwin Glaser, owner of Glaser Rare Books in Napa, said. At age 28, Peter Howard became the youngest member at the time to join the Antiquarian Booksellers' Association in 1966 and served as the association's president from 1992 to 1994. His prestige in the trade was exemplified in his renowned biennial open house put on for the past 26 years, attended by rare book dealers from all over the world. Peter Howard is survived by his two daughters, three grandchildren and niece. A private memorial will be held on May 7 in his memory. A previous photo of Marc Selvaggio was accompanied by a photo caption that incorrectly identified him as Peter Howard.